If you own a bike but don’t have a garage, you have two enemies: oxygen; famous for corroding everything for billions of years and low-life scrotes, oxygen-wasters, out to pinch your pride and joy. For decades, the weather has been the number-one enemy but in the last few years, motorcycle and scooter theft has become public enemy number-one for bikers across the country. Stolen motorcycles are big business. Easy money for opportunist scrotes and organised criminals. A bike cover decreases the chances of your bike being stolen by making it less visible to thieves. 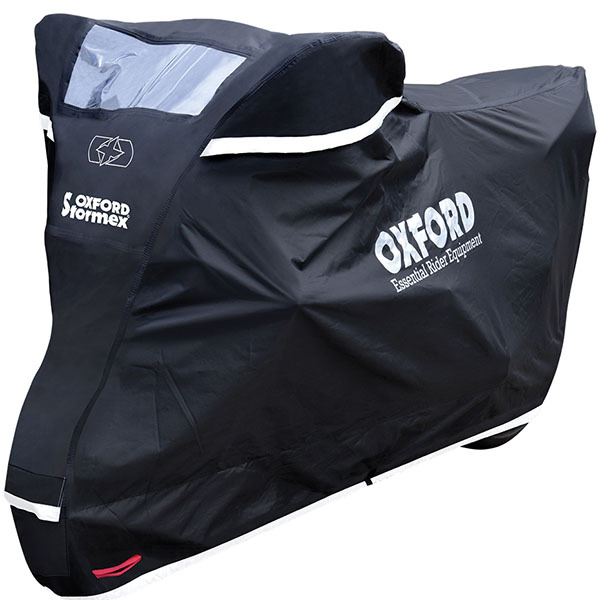 This no-nonsense outdoor motorcycle cover from Oxford is both waterproof and heat resistant. It features double-stitched nylon for added durability, an eyelet to loop a chain through and an underbelly strap to keep it in place. It’s available in different sizes and for bikes and scooters with topboxes. The Rolls Royce of bike covers? Made from a heavy-duty outer with a soft-lined inner to protect your motorcycle’s paintwork. The Stormex featured an elasticated hem, eyelet to loop a chain through, an underbelly strap and a solar-panel window, allowing you to connect up a trickle charger. Two wheeler theft has risen by a massive amount (25 years ago, scooters accounted for less than 1% of all two-wheeled theft and now it’s over 50%). Motorcycle theft in large cities like London, Bristol and Liverpool has risen by over 30% every year for the past 5 years. That’s a staggering rise. The rise of motorcycle theft has been fuelled by the police’s policy to not pursue riders after drug dealer Henry Hicks died on a moped trying to out-run the police. This soft policy has escalated motorcycle and scooter theft for two main reasons. Number one: a two wheeler is a get out of jail card for scum who would have otherwise broken into cars, mugged or burgled on foot. So the demand from scummy low-lifes for a two-wheeler to get around has risen. Secondly, gangs who go out to pinch scooters, often 4 guys on two scooters, act with the confidence that they have a greater chance of getting away as they won’t get chased. They operate with almost total immunity. One cuts the lock, the other stands on look-out and the other two remain on their scooters, ready to get away. More motorcycles are stolen every year than are bought new. These oxygen thieves are killing motorcycling. So what has this got to do with bike covers? We all know a bike cover won’t stop bike theft but it’s one of the important layers of security, to keep your bike safe. Unfortunately, the best approach to bike security is to make your bike less of a target than the other ones out there. A non-descript motorcycle under a cover means that all but the most eagle-eyed thieving scrotes will know what’s under the cover. From 50 metres away, it could be a £1,000 hack or a £20,000 superbike and the chances are it won’t get noticed by a majority of the low-lives out there. If you’re on a tight budget, never fear. We’ve found this motorcycle cover for under a tenner. Even though it’s a budget pick, it features elastic hems and a securing strap to keep it in place. However, for just £4 more, this cover looks like a good shout for budget bikers. It features an elasticated hem, two eyelets to enable you to pass a lock through and a retaining clip. It is currently rated at 5 out of 5 from nine reviewers on Amazon and at under £15, what’s not to like? You can buy a cover from as little as £10 or over £100. We think you should budget based on how long you think you’ll keep the cover. If it’s parked on the street in London, then an expensive cover by get pinched by someone who fancies a decent cover or slashed by scummy scooter thieves who want to p*ss you off. Cheaper covers are often made from a much lighter weight material that can tear if caught on say your number plate or footpeg but there’s no reason why you can’t get a year’s worth of use out of a cheap cover. A carry case: covers are bulky – it’s handy to have a zip-up case to stuff it into when you’re not using it, protecting it from being torn or picking up grit which would damage the paintwork. Underslung strap: Essentially this keeps the cover in place and stops the wind making it ride up or be blown off completely. Provision for mirrors: We like covers that have a additional material for mirrors. Firstly, it makes it easier to figure out which way to put the cover on, meaning you can get it on faster and secondly, it helps the cover fit the bike’s shape better, keeping the cover more securely in place. A number-plate window: The down side to one of these is that thieves can spot the year and work out the make and model of the bike by just passing, but a window is handy if you park your bike in a controlled parking area and want to avoid a parking ticket. Eyelets for your security chain: Usually in metal, normally by the front wheel but sometimes covers have an eyelet front and rear. These are great as they allow you to easily put a chain through the cover, securing the cover in place and making it hard to lift or blow away. Vents: Any build-up of moisture-rich air is reduced by allowing fresh air to circulate through the cover, reducing the effects of corrosion. Elasticated rim: Brilliant for keeping the cover in place, an elasticated rim is, for me, one of the most important features of a cover. They often end up riding up the front wheel and gripping in place under the front mud guard – handy to ensure the cover stays fitted. Store your cover in a bag to prevent it picking up dirt on the inside and scratching your paintwork. Wash your cover while it’s on the bike once a year, to clean off the build-up and help it stay waterproof. Make sure you buy the right size. A cover that’s too large will flap around, be more likely to rub the paintwork and more likely to come off. Can you use an outdoor bike cover indoors? Absolutely. However if you are always going to park the bike in your shed, under a porch on in a garage, you might not want such a heavy-duty outdoor cover. One of the lightweight outdoor motorcycle covers would be a better bet, as they won’t need to stand up to the elements and will be easier to manage. 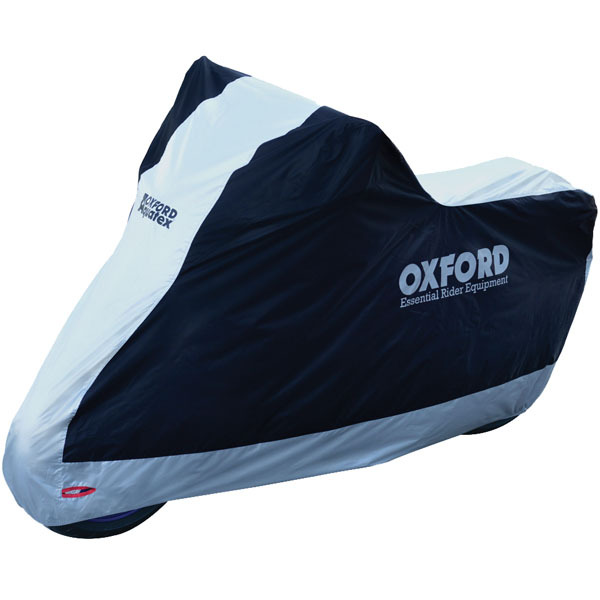 If your motorbike or scooter is always going to be parked indoors, in a garage or shed, then an indoor-specific bike cover is a better option – they are made from different materials to outdoor covers, are designed to keep the dust off and – unlike an outdoor cover – can be machine washed. 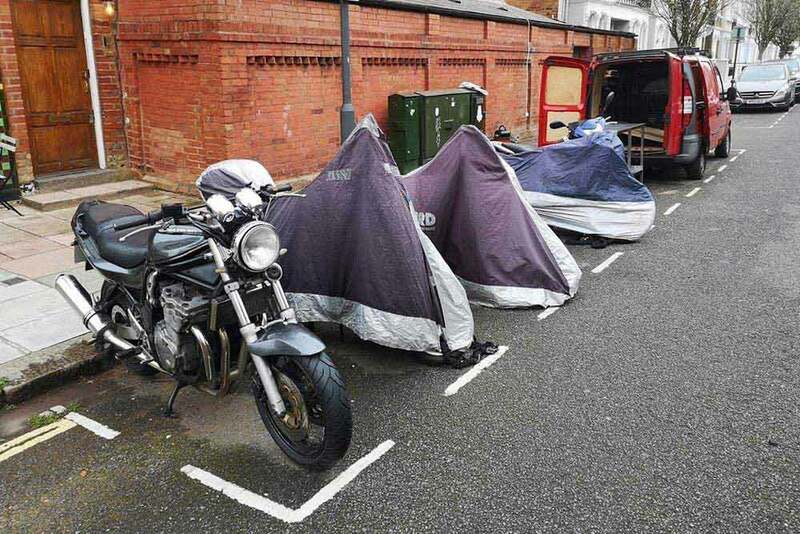 Some people claim that a bike cover makes you immune to parking tickets as a parking warden ‘can’t legally touch your bike’. This is – unfortunately – a myth. Technically speaking, covering your number plate is an offence (under S43(1) of Vehicle Excise and Registration Act 1994) but only the police, not parking wardens, have the right to issue a Fixed Penalty Notice for this offence. If you are going to park on the street, especially if you are in a controlled parking area, it’s a good idea to get a bike cover with a number-plate window. Bennetts Insurance: Motorcycle Crime – The Facts. Surrey Police: How to protect your home and belongings.